Reader Kristen has recently been given an opportunity to sell some luxury townhomes and wants to look polished and professional on a budget. She loves wearing dresses (particularly sheaths and pencil style skirts) and is interested in trying some wide leg trousers. She doesn't want super high heels because she'll be on her feet quite a bit. Here are the outfits I sent her, click on any image for more information. Here are several dress options that I found that I thought were cute and are definitely affordable. 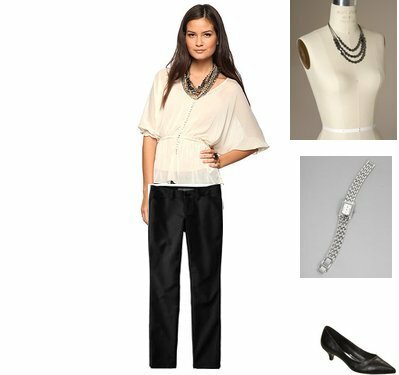 For most of these outfits you could change out the pants for skinny pants (or wide leg) or a pencil skirt and vice versa. Wide Leg Pants by New York & Co.